Platinum Twist Engagement Ring using the Customers Diamonds — Form Bespoke Jewellers Ltd.
A bold and beautiful twist engagement ring using the customer’s diamonds and cast in platinum. It is always lovely when we can rework the customer’s existing jewellery into a bespoke piece that they will enjoy wearing. Especially jewellery as special as an engagement ring! 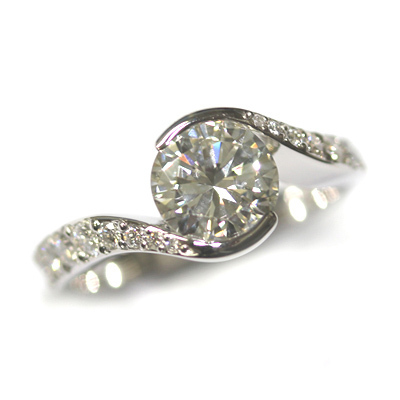 Here, we hand-set the customer’s diamonds into a twisting design. The platinum shoulders wrap up and around the largest round brilliant cut diamond giving a half-collet illusion. Then the shoulders have been set with graduating diamonds creating a sparkling frame. 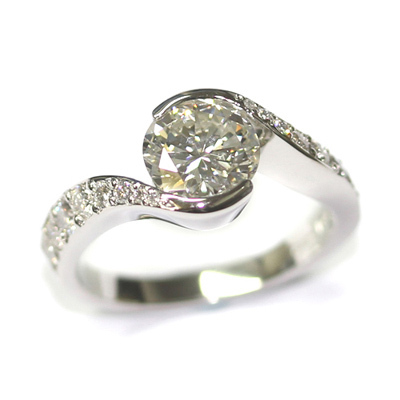 The customer was thrilled with the redesign and their bespoke twist engagement ring.